I have enjoyed reading about your embroidery, dolls and family!! What an uplifting blog! 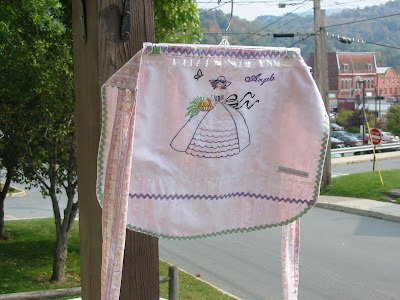 That is an adorable apron! That is so pretty...I love crinoline ladies. What a lovely apron indeed. I love your attention to detail. Just beautiful! That is just so pretty - I'm sure your customer will adore it! Oh, it's a pretty crinoline lady! I just finished a pillow last night with an appliqued lady that my grandmother made in the forties! I love their demure sweetness! 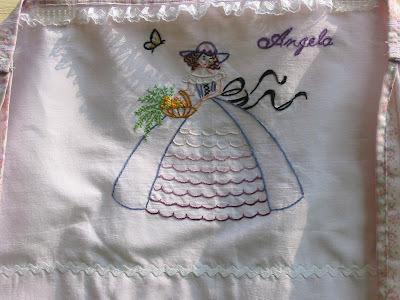 Beautiful embroidery Meg - love it. Would still love to see some pics of your lovely town. It looks very nice in the background of your shots.